To me, few things in life are as exciting as the start of the NHL playoffs. (Go Caps!) 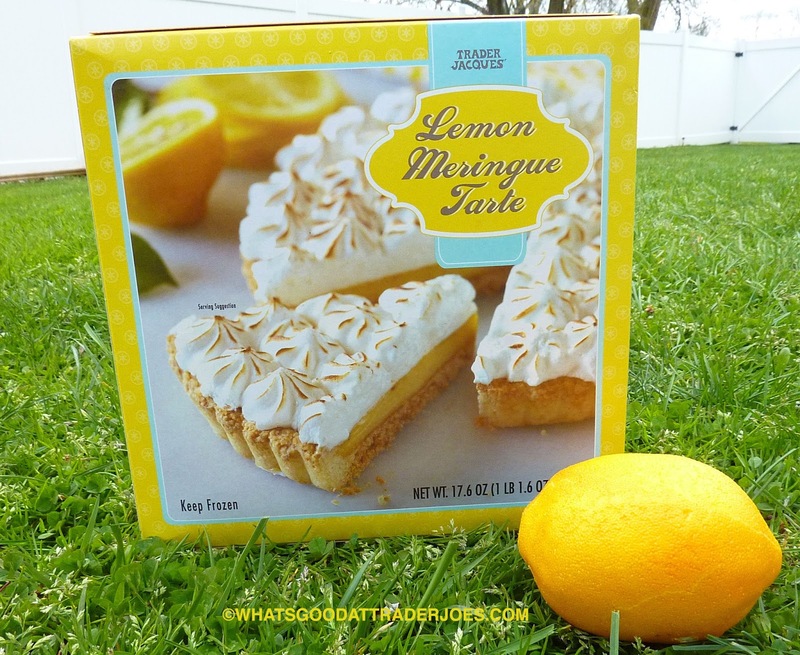 But new lemon-flavored TJ's products just might be on that short list—because the store has an excellent track record in that department. And as is the case with professional ice hockey, you're bound to run into a French name or two in the world of TJ's fine desserts. Bonjour, Jacques! There's a layer of sweet and sour lemony goodness right at the heart of this pastry. 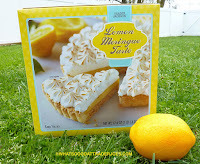 It's tart and tangy and has pretty much everything lemonophiles are looking for. The crust is buttery and thin and adds a bit of firmness to the otherwise airy dessert. It's so good, if anything, I wish there were more of it. In the past, Sonia has complained about meringue getting in the way of her enjoyment of similar pies and tartes on the basis that it's "too eggy." Not here. 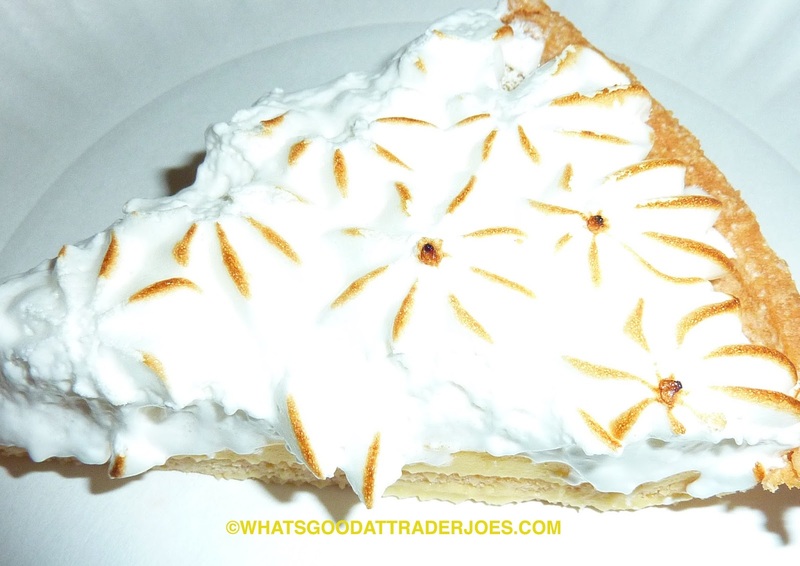 The meringue is a very neutral, lightly-sweet whipped topping—the literal icing on the cake...er, pie...er, tarte. Also, it's lightly toasted around the edges, as seen in the photo to the right. Sonia also raved about the presentation of this product, pointing out the perfect little peaks of meringue all evenly-spaced on the top of the pie. Although, in our box, about a third of the meringue came off of the pie and stuck to the plastic lid when we removed it. It was simple enough to scrape it off and re-apply it to the tarte, but still should be noted in case you're buying this for the dessert table at some uber-formal event or something. All in all, this is another lemony win for TJ's. It's definitely something Sonia and I could see ourselves purchasing again. $5.49 for four servings. Not super cheap, but worth it. Four and a half stars from Sonia, four from me. just when I though I couldn't love y'all more... two things I adore - meringue and the Capitals. Heck yeah. Stanley Cup here we come! The amount of sugar is high but I need to give it a try. That sounds so good. It made in France so those French people know their pastries. And $5.49 is super cheap guys....lol. I grew up & lived in several cities in Maryland/DC. Also lived in VA, several places in Southern California and now Seattle. Any one of those places or anywhere near any of those places you would spend that much or more on an individual tartlet. And those are all very expensive areas! I was thinking more along the lines of - if you're at TJ's, there are lots of dessert options for under five and a half bucks. But yes, if you're comparing it to other meringues, $5.49 isn't bad at all. Is it ready to eat or needs to be baked? Comes frozen, just needs to thaw.